Music Question: "Bar Song" in "Face of the Enemy"
Music Question: \"Bar Song\" in \"Face of the Enemy\"
I'm new and come from Germany! 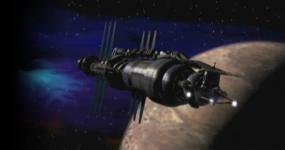 I hope you know the Song [Bar Background Music] in the B5-Episode [S04E17]: "Face of the Enemy". First when Sheridan enters the bar started the song and then when Sheridan starts to feel the effects of the tranq and things get woozy and fierce. This song is also on the Episodic-Soundtrack-CD of Christopher Franke, but there are no credits about this song. I've contacted Chris Franke, but he also answer that the song was from him. About the female voice, I'm waiting a long time for an answer and he don't answer. So my question: Does anbody know the female voice of the Bar Song??? It heard's like the song "Hardly Rain" of PJ Harvey and Juliette Lewis. But this are not the female voice of the bar-song. Only the guitar-intro it's the same, but not the text. I hope one of us can help me! Re: Music Question: \"Bar Song\" in \"Face of the Enemy\"
Unfortunately, the only info I have is trivia from the books. The director, Mike Vejar brough ta tape of the song in and they shot the scene with that song playing in the background. That's why the scene is so intense. It's one of my favorite episodes for that scene and the one of Garibaldi 'waking up' from Bester's programming. There is no mention of who did the song, or any other credits. There are a lot of sources out there, I'm sure one of them has the song info. The song is called "Hardly Wait" and was written by PJ Harvey. The version on B5 is the one sung by Juliette Lewis in the movie "Strange Days". Please note that only the first part of the song is played - once in "Face of the Enemy" Sheridan starts punching and gets thrown, the song has "morphed" into Christopher Franke. "Stay the line / walk the line..."
Thanks for your reply. You've absolutly right! But now, we ever don't know, what's the female voice of the "Bar Music"! Just thought I'd impress you with unsolicited information. It's pure speculation, but I believe the vocalist is none other than Marjorie Monaghan, who plays the character "Number One" in this, and other B5 episodes. She is an accomplished singer, and the timbre of her voice and our unidentified muse are similar. Lyrics in parenthesis are uncertain, but this is what they sound like to me. On a related note, what is the pop song that plays in the casino in Chrysalis? Like the bar music from Face of the Enemy it's on the soundtrack CD but there's no information about it. I'd assumed they were original music by Christopher Franke since no one else is credited? I always thought it was written by Chris Franke since I don't remember there being any specific credits. But other than the lyrics it's an almost exact copy of that song. I do prefer the B5 version a bit more though. This is what I make of the lyrics.